The Pigeon Forge and Sevierville Trolley System strive to help keep the Smoky Mountain air clean. 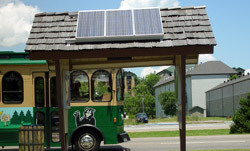 Pigeon Forge is beginning to use solar panels on their shelters to power the Global Positioning Satellite Reader Boards that inform our customers on the time frame of the next trolley arrival. By “parking your cares and riding with the bears” you too can help us all breathe easier.